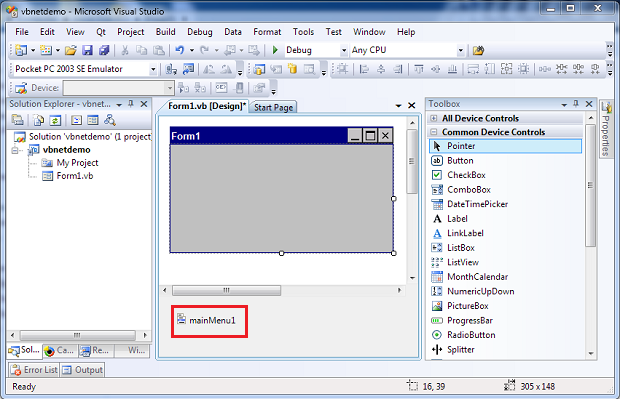 Before starting to create a new Visual Basic.net application project with Visual Studio 2008, please refer to the article on how to setup development environment here. 1. Start Visual Studio 2008. 2. On the File menu, click New and then Project. The New Project dialog box appears. 3. 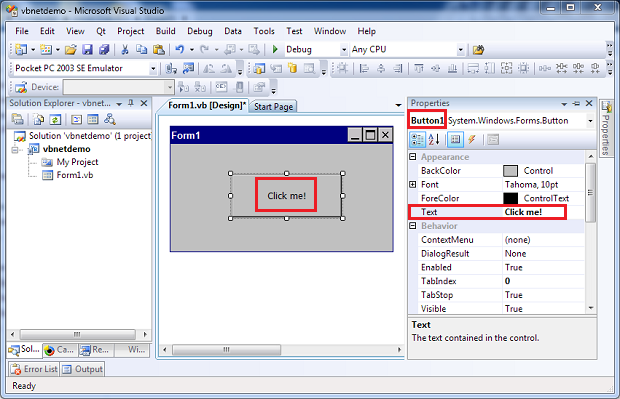 In the Project types pane, expand Visual Basic node and select Smart Device. In the list of templates, select Win32 Smart Device Project. 4. Specify a name and a location for the application and then click OK. Uncheck the Create directory for solution box. 5. In the Target platform, select Windows CE. 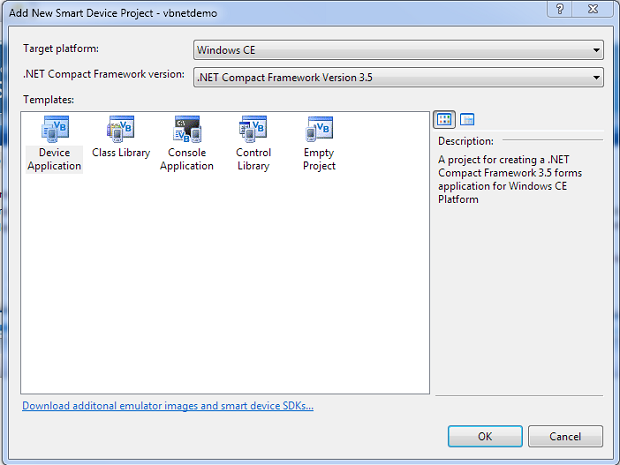 In the .NET Compact Framework version, select .NET Compact Framework Version 3.5. From Templates, select Device Application. Click OK.
6. Following is an illustration of the editor screen. This demo does not illustrate menus, so delete the item mainMenu1. 7. From the Toolbox select Button to add a button to your form. 8. Right click on the Button1 and select Properties. 9. Change the Text to "Click me!" 10. Click on Form1. Change Text to "VB.net demo"
12. 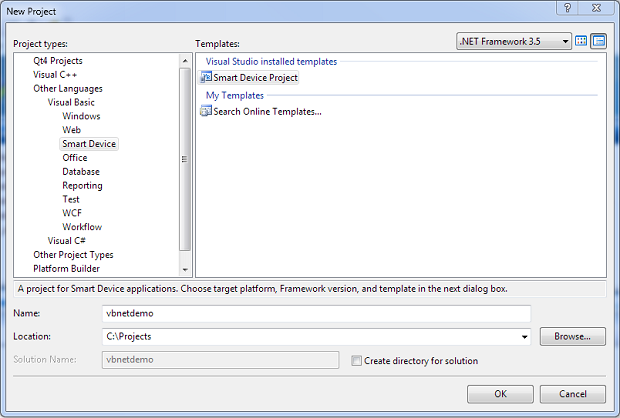 To build the VB.net application project, in the Build menu, click Build Solution. NOTE: Before deploying the project to Colibri module, connect the Colibri to the PC using a USB cable (On Iris - Micro-USB type connector at Colibri side and USB A type at the PC side, On Colibri Evaluation board - Micro-USB or USB B type connector at Colibri side and USB A type at the PC side). Power up the board. The device will be shown as connected in Windows Mobile Device Center (for Windows 7) or Active Sync (for Windows XP) in a few seconds. Click on CeRHost to start the Remote Display(PC side). Navigate to Solution Explorer in Visual Studio. Right Click on Solution->Properties->Devices. Uncheck "Deploy the Latest version of the .NET Compact Framework(including Service Packs)". 13. To deploy the project, in the Build menu, click Deploy Solution. 14. In the Deploy vbnetdemo window, from Device, select Colibri600 ARMV4I Device if you are running Windows CE6 on Colibri. For users running Windows Embedded Compact 7 on Colibri, select SDK2wince7 ARMV7 Device. Deploying process will take 1-2 minutes. 15. After deploying, on the Colibri module, open My Device. Select Program Files. 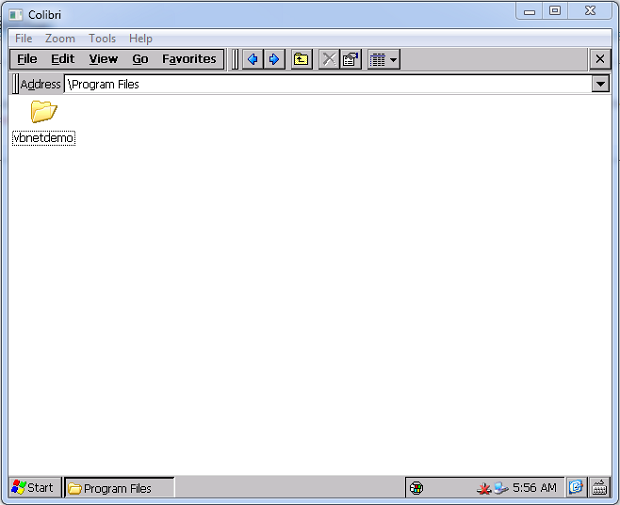 The vbnetdemo folder contains a .exe file to run the application. 16. Double click the .exe to Run the application. Click on "Click me!". 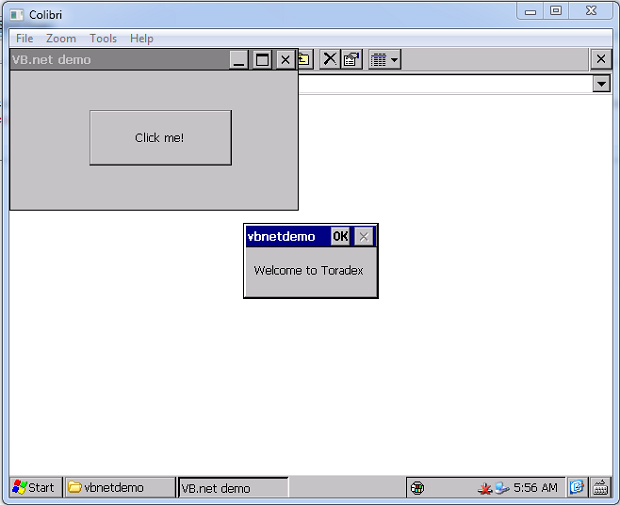 Message box "Welcome to Toradex" will be displayed. You can download project source code from here.